In 1902, a fine new building went up just across the street from downtown’s beautiful Spencer Square. Located at 1903-05 Second Avenue, it was named for its owner and marked “Peter Fries”in relief copper letters. Although the name is blacked out on the postcard, it was located in the rectangle between the second and third floors. Five years earlier, in 1897, Mr. Fries had built in another handsome building just two blocks west that included a similar panel displaying the words “Fries Building.” That first structure was renovated as part of the Renaissance Building. This Peter Fries Building (Family Theatre) was probably designed by the architectural firm of Drack and Kerns, who had designed the earlier building. Similarities between the two structures abound, especially in their use of triple windows within three separate bays. Instead of the decorative round windows seen near the cornice of the Fries Building, this one uses dramatic arched windows atop each bay. Although the postcard calls this the Family Theatre, the original occupant was the Central Bowling Alley and Billiard Hall. Upper rooms were rented for a dancing studio. Bowling and billiards didn’t last. Only a few years later, the building was converted into the Family Theatre, a vaudeville operation. 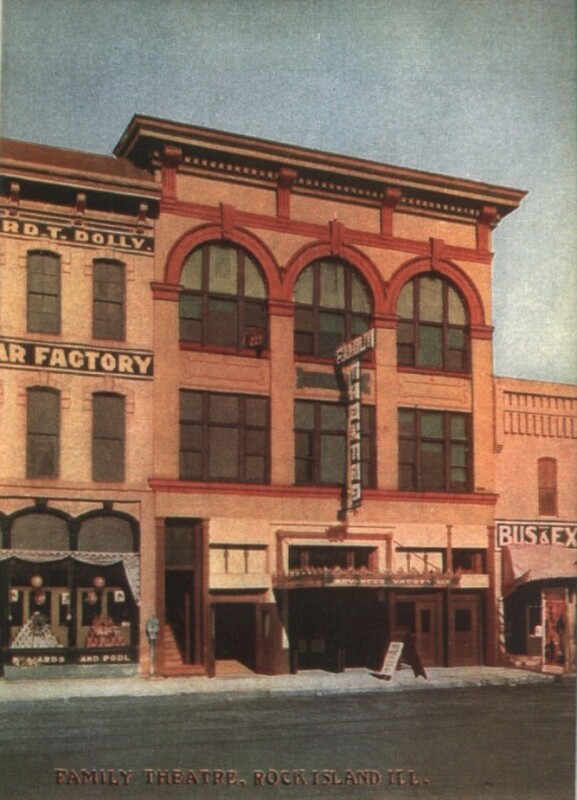 The Knights of Columbus rented the entire third floor and part of the nearby Dolly building as well The postcard shows that the Family Theatre had a large sign hanging perpendicular to the building. The marquee was a simple but elegant canopy that offered protection but no advertising. Notice the sign on the sidewalk, probably touting the current entertainment. Since the postcard building is called the Family Theatre, it can be dated as before 1915, when architect George Stauduhar drew plans to once again remodel the theatre, this time into a movie house. With the remodeling came a name change. The Family Theatre became the Spencer Square Theatre. A 1936 photo of the Spencer Theatre shows a larger but still elegant marquee advertising the current movie, “Black Legion,” starring Humphrey Bogart. Admission at the time was noted as 15 cents for matinees and 25 cents for evenings. Although the upper two stories in 1936 are unchanged from the postcard, the street level looks quite different. Most notable, in addition to the marquee, is a new “Arabian” balcony enclosing a latticed Gothic window set above the doorway on the left. Perhaps this whimsical feature was intended to set the scene for an interior theme. It is hard for younger folks to believe how accessible movies were a couple of generations ago, by foot, car, or public transportation. Downtown Rock Island – as did other communities – had several theatres. Even more theatres were located in Rock Island’s smaller business areas on 14th Avenue and on 9th Street. Nowadays, of course, a movie theatre is a long drive from just about anywhere. Spencer Theatre continued as a movie house until around 1950, although the upper floors were converted to Spencer Apartments sometime in the 1940s. Then the theatre closed with the apartments remaining a bit longer. Finally, in the mid 1950s, the Peter Fries Building as well as the adjacent Dolly Building are identified in City Directories only as “City Parking Lot.” Later, the small parking lot was enlarged by the demolition of the remaining buildings facing Second Avenue. This article by Diane Oestreich is slightly modified from the original, which appeared in the Rock Island Argus and Moline Dispatch on March 24, 2002.